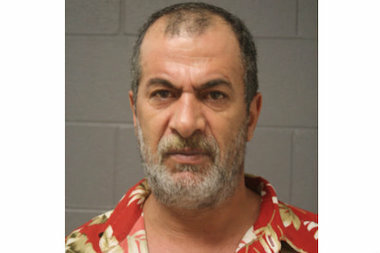 Emad Karakrah, a native of Palestine, allegedly was driving on South Kedzie Avenue Wednesday morning with a flag of the ISIS terrorist group flying from his car. He led police on a chase after they tried to pull him over and later threatened them with a bomb, prosecutors said. COOK COUNTY CRIMINAL COURTHOUSE — A man with an ISIS flag flying from his car window led police on a chase and threatened them with a bomb, prosecutors said Thursday. Emad Karakrah, a native of Palestine, was seen driving a silver Pontiac in the 7700 block of South Kedzie Avenue Wednesday morning around 9 a.m., prosecutors said. He was flying a flag representing ISIS, the Islamic extremist group that has taken over parts of Iraq and Syria, and has reportedly threatened attacks in Chicago. Police tried to curb Karakrah's vehicle, but he hit the gas, Assistant State's Attorney Lorraine Scaduto said. Police pursued Karakrah while calling for back up. Karakrah, 49, led police on a chase reaching 100 mph, Scaduto said. They ultimately called off the chase for safety reasons. When officers caught Karakrah near a gas station at 72nd Street and Kedzie, he threatened them with a bomb, prosecutors said. The bomb squad and the Department of Homeland Security were called, and a six-block radius was shut down for two hours while officials searched for an explosive devise, prosecutors said. But none was found. Charged with disorderly conduct, aggravated fleeing and various traffic citations, Karakrah was ordered held on $5,500 bail.